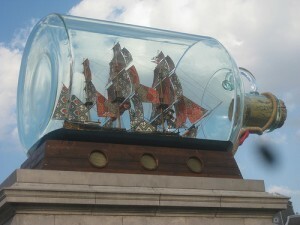 The National Maritime Museum has launched a fundraising campaign to buy the current Fourth Plinth artwork, Nelson’s Ship in a Bottle. The Greenwich museum wants to provide Yinka Shonibare’s sculpture with a permanent home when it is replaced on the Fourth Plinth in Trafalgar Square in January. It would be a perfect fit for the museum; going on display outside the new Sammy Ofer Wing entrance, and complementing the museum’s maritime collection. The Art Fund has already contributed a £50,000 grant to the campaign. However the museum will have to raise an additional £362,500 to buy the piece and keep it on public view. The National Maritime Museum is asking for public donations to make up the amount. It’s what the artist wants: Yinka Shonibare said, "I would very much like to see the work have a permanent home at the National Maritime Museum. I worked closely with the NMM earlier this year on a series of events and for me the location and the collection are the perfect future home for this work."